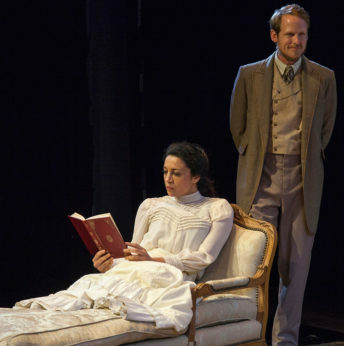 GLENDALE, Calif.—A version of Ivan Turgenev’s A Month in the Country, rewritten by playwright Patrick Marber, is now enjoying its West Coast premiere production by the Antaeus Theatre Company. The play dates from 1855, but it was not staged professionally until 1872. Originally it ran over four hours (and in Russian! ), which could seem like you actually spent a month in the theatre. At two and a half hours in duration the Marber treatment seems just about right—enough time to appreciate the longueurs of countryside idiocy (to paraphrase Marx) and to absorb quite enough of these charmingly feckless people with altogether too much idle time on their hands. The word “otiose” is often applied to people like this—indolent, useless, superfluous—a whole demographic stratum in imperial Russia without truly productive lives who became a prototype in Russian literature. The co-artistic directors introduce the play as one about love: “It makes you giddy with joy, writhe with pain, and behave ridiculously…. Everyone is in love with someone they shouldn’t be in love with.” Affairs of the heart are certainly the main theme of the play, but the context is what raises it up from farce and makes it a seminal work of Russian and world literature. Turgenev’s play is often described as “Chekhovian,” but chronologically it’s just the reverse. It was this play that inspired fiction writer Anton Chekhov to write his serious comedies of manners for the theatre. Both playwrights focus on the sterile gentry who have no greater aspiration in life than to find quiet, passive comfort in country life and the servitude of their household retainers. A generation later, in Chekhov’s time, we already see the decline of that class with the encroachment of industry and housing developments and the ambitions of clever new entrepreneurial types, often rising from the bottom, that sought not just subsistence but profit from these estates. It was particularly after Chekhov’s stage works became popular that Russian audiences rediscovered Turgenev’s play, realizing it was the great forerunner in their national theatre. A Month in the Country was only occasionally staged in Western countries, but Turgenev’s novels, particularly Fathers and Sons and Virgin Soil, exerted a profound effect on young leftish minds in the late 19th and early 20th centuries. In their depiction of peasant life and the role of the intelligentsia they seemed to foreshadow political developments in Russia in a way that the more cerebral, religious and moral novels of Tolstoy and Dostoyevsky did not quite do. Actually in this version we don’t even see what it is that they do on this estate. Is this just subsistence farming for the serfs on the land? Did they owe a percentage of their crop to the owners? Did they raise crops (which crops? potatoes, beets, rye, barley, wheat?) for the market (and for only the local market or a wider national or even international market?). I would have liked more clarity on this point, for we are dealing with lives and livelihoods of a thousand people living on Arkady’s estate. The larger point, and one that Turgenev surely was making, is that the economy at this underdeveloped level of productivity, multiplied by the thousands of other such estates spread over the Russian lands, was stagnant and only at best self-sustaining. Compared to the more industrialized Western Europe, Russia was truly a backward nation, the talents and potential of its people wasted on imperial excess that almost seemed to demand ignorance and backwardness amongst the broad peasant masses. For if they knew otherwise, they would surely not put up with it. Which, as we know, is exactly what happened a couple of generations later. Kolya’s playful aiming of an arrow at his father can be seen as a symbolic killing off of a parasite class and generation. So we have a story centered in misplaced amorous attentions. We may only hope and presume that Kolya’s handsome young tutor Belyaev (Peter Mendoza)—with whom no fewer than three of the ladies at the estate fancy themselves in love—will return to Moscow and educate himself as to the future for a brighter Russia, which he intimates by saying, “In a hundred years this world and its ways will be ash.” How true that would be! The lovely scenic design by Se Hyun Oh captures interior and outdoor spaces effectively with minimal moveable sets. In particular I was entranced by Kolya’s red kite-flying scene (should we infer some significance in that color?). Likewise, the lighting by Jared A. Sayeg set the mood at various times of day and in a variety off emotional states. A. Jeffrey Schoenberg’s costume designs were country elegant; his basic color was an off-white linen, set off by a vest, a hat or jacket and footwear as appropriate. Performances feature two different 13-member casts–“The Blunderers” and “The Assassins” (I saw the latter) so if you are interested in seeing a particular actor check the website first to see which cast is performing. It’s a treat to have this high-grade company (we reviewed their recent Native Son) take on this underappreciated and rarely performed play. The witty, lusty Patrick Marber version is sure to become the new standard. 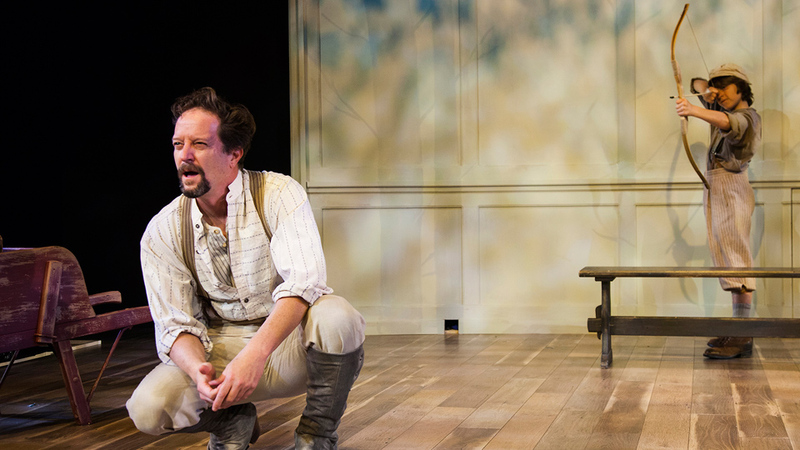 Three Days in the Country continues through Aug. 26, with performances Fri. and Sat. at 8 pm, Sun. at 2 pm, and Mon. at 8 pm. 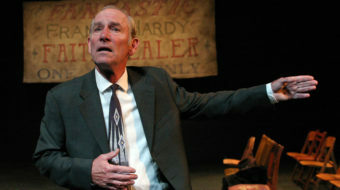 Antaeus Theatre Company is located at the Kiki & David Gindler Performing Arts Center, 110 East Broadway, Glendale 91205. Parking is available in the Glendale Marketplace garage at 120 S. Maryland Ave. (between Broadway and Harvard), first 90 minutes free, then $2 per hour. Go here to view cast schedule, find other information about the play and the theatre, and purchase tickets. 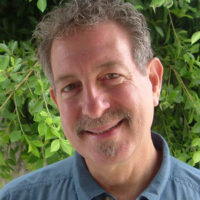 The company phone number is (818) 506-1983.